I really like the comic strip Red and Rover. Featuring 10-year-old Red and his dog, Rover, it is set in the 1960s when boys really often did go barefoot all summer long. And that is how Red is often depicted. The joke in this strip, from last Tuesday, has nothing to do with Red being barefoot. It’s just the first time he has appeared barefoot this year. 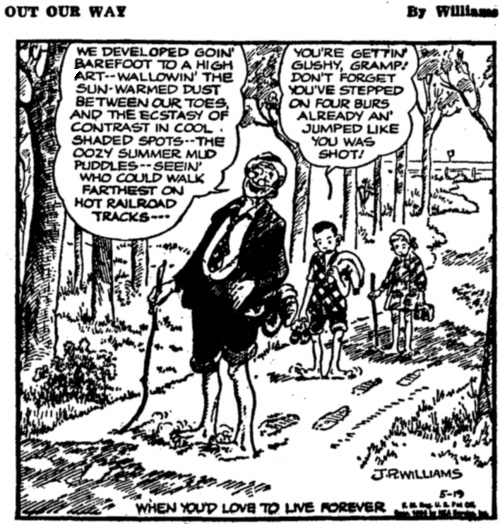 Here’s an old comic strip from May 19, 1955. It’s from Out Our Way by J. R. Williams. Follow the daily life of Yenny Lopez, a Latina teen girl who lives with her mother Yunissa, her sea turtle Buke and a fast talking-iguana called Zacha at a modest wooden house complex in Villa Los Kubos, Puerto Rico. Yenny dreams of becoming a famous model, but her big, giant feet stand in the way. In the meantime, she studies at the Carizzio Modeling College with high hopes of seeing her dream become a reality. But if you have “big, giant feet”, you might as well use them. This strip appeared last month. Kuu ana ula, ku lalani na koa kapa keokeo. In my red cave stand in rows white-clad soldiers. Got it? Get the idea?